The Sword of Song. Called by Christians The Book of the Beast. The second copy currently resides in the Harry Ransom Center, University of Texas, Austin, Texas, in the Aleister Crowley archive, subseries A., Magical Works, 1898-1947, box 4, folder 7. 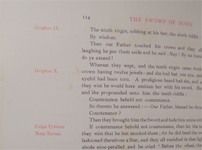 Upper cover lettered in gilt ‘Ye SWORD | ‘666’ repeated three times on golden square | OF SONG’. Spine lettered in gilt ‘[across] THE | [down] SWORD | [across] OF | [down] SONG’. Letters and Telegrams: BOLESKINE FOYERS is sufficient address. Bills, Writs, Summonses, etc. : CAMP XI, THE BALTOR GLACIER, BALTISTAN. on page _____ of my masterpiece, “The Sword of Song,” that I should send you a copy, as I do herewith, to give you an opportunity of defending yourself against my monstrous assertions, thanking me for the advertisement, or – in short, replying as may best seem to you to suit the case. Holograph manuscript and typescript versions, bound together, with revisions in the hand of Aleister Crowley. Pages: 171. Dated: 1903. Box 4, Folders 6-7. Harry Ransom Center, Austin, TX. The Collected Works of Aleister Crowley, Vol. II, Page 140, Society for the Propagation of Religious Truth, Boleskine, Foyers, Inverness, 1906. + Gordon Press, New York, 1974. L. C. R. Duncombe-Jewell, Notes Towards An Outline of A Bibliography of the Writings in Prose and Verse of Aleister Crowley, The Works of Aleister Crowley, Volume III, Appendix A, Gordon Press, New York, 1974, p. 238. 3. Timothy d'Arch Smith, The Books of the Beast, Mandrake, Oxford; 1991, p. 120. 5. Dianne Frances Rivers, A Bibliographic List with Special Reference To the Collection at the University of Texas, Master of Arts Thesis, The University of Texas, Austin, Texas, 1967, p. 34. 7. Complete Catalog of the Library of John Quinn, Sold by Auction in Five Parts, Volume one, ABB-MEY, the Anderson Galleries, New York, 1924, p. 227. 8. Keith Hogg, Bibliotheca Crowleyana, Sure Fire Press, Edmonds, Washington, 1989, p. 7. 9. Tobias Churton, Aleister Crowley: The Biography, Watkins Publishing, 2011, pp. 108-109. 10. Aleister Crowley, The Works of Aleister Crowley, Volume II, Gordon Press, New York, 1974, p. 198. 12. Aleister Crowley, Magical Diaries of Aleister Crowley: Tunisia 1923, Stephen Skinner, Editor, Red Wheel/Weiser, Boston, Massachusetts, 1996, pp. 207-208. 13. Online auction catalog. Keys Fine Art Auctioners, Palmers Lane, Aylsham, Norwich, NR 11 6JA, United Kingdom, Lot 105, sold 19 November 2015. Last accessed on 19 November 2015. 14. “Excerpt A - From the Catalogue. The Works of Mr Aleister Crowley” Bound in at the rear of Oracles: the Biography of an Art, Society for the Propagation of Religious Truth, circa 1905, p. 9. 15. Lilly Library, Indiana University, Bloomington, Indiana: https://iucat.iu.edu/catalog/468730 . I had made a point from the beginning of making sure that my life as a Wanderer of the Waste should not cut me off from my family, the great men of the past. I got India-paper editions of Chaucer, Shakespeare and Browning; and, in default of India paper, the best editions of Atalanta in Calydon. Poems and Ballads (First Series), Shelley, Keats and The Kabbalah Unveiled. I caused all these to be bound in vellum, with ties. William Morris had re-introduced this type of binding in the hope of giving a mediaeval flavour to his publications. I adopted it as being the best protection for books against the elements. I carried these volumes everywhere, and even when mu alleged waterproof rucksack was soaked through, my masterpieces remained intact. Let this explain why I should have been absorbed in Browning’s Christmas Eve and Easter Day at Tuticorin. I was criticizing it in the light of my experience in Dhyana, and the result was to give me the idea of answering Browning’s apology for Christianity by what was essentially a parody of his title and his style. My poem was to be called “Ascension Day and Pentecost”. I wrote “Ascension Day” at Madura on November 16th and “Pentecost” the day after; but my original idea gradually expanded. I elaborated the two poems from time to time, added “Berashith”—of which more anon—and finally “Science and Buddhism”, an essay on these subjects inspired by a comparative study of what I had learnt from Allan Bennett and the writings of Thomas Henry Huxley. These four elements made up the volume finally published under the title The Sword of Song. — The Confessions of Aleister Crowley. New York, NY. Hill and Wang, 1969. Pages 256-257. The twentieth and twenty-first were great days in my life. I wrote an essay which I originally gave the title “Crowleymas Day” and published under the title “Berashith” in Paris by itself, incorporating it subsequently in The Sword of Song. The general idea is to eliminate the idea of infinity from our conception of the cosmos. It also shows the essential identity of Manichaeism (Christianity), Vedantism and Buddhism. Instead of explaining the universe as modifications of a unity, which itself needs explaining, I regard it as NOTHING, conceived as (illusory) pairs of contradictories. What we call a thought does not really exist at all by itself. It is merely half of nothing. I know that there are practical difficulties in accepting this, though it gets rid so nicely of a priori obstacles. However, the essay is packed with ideas, nearly all of which have proved extremely fertile, and it represents fairly enough the criticism of my genius upon the varied ideas which I had gathered since I first came to Asia. — The Confessions of Aleister Crowley. New York, NY. Hill and Wang, 1969. Pages 275-276. One incident became immortal. I wrote in The Sword of Song that I “read Lévi and the Cryptic Coptic”, and lent the manuscript to my fiancé, who was sitting for Gerald Kelly. During the pose she asked him what Coptic meant. “The language spoken by the ancient Copts,” replied Kelly and redoubled his aesthetic ardours. A long pause—then she asked, “What does cryptic mean?” “The language spoken by the ancient Crypts,” roared the rapin and abandoned hope of humanity. — The Confessions of Aleister Crowley. New York, NY. Hill and Wang, 1969. Page 356. I had completed The Sword of song before I left Paris and left it to be printed with Philippe Renouard, one of the best men in Paris. I intended to issue it privately. I had no longer any ideas about the “best publisher”. I felt in a dull way that it was a sort of duty to make my work accessible to humanity; but I had no idea of reaping profit or fame thereby. — The Confessions of Aleister Crowley. New York, NY. Hill and Wang, 1969. Page 359. I have never lost sight of the fact that I was in some sense or other The Beast 666. There is a mocking reference to it in “Ascension Day”, lines 98 to 111. The Sword of Song bears the sub-title “called by Christians the Book of the Beast”. The wrapper of the original edition has on the front a square of nine sixes and the back another square of sixteen Hebrew letters, being a (very clumsy) transliteration of my name so that its numerical value should be 666. When I went to Russia to learn the language for the Diplomatic Service, my mother half believed that I had “gone to see God and Magog” (who were supposed to be Russian giants) in order to arrange the date of the Battle of Armageddon. — The Confessions of Aleister Crowley. New York, NY. Hill and Wang, 1969. Page 387. My activities as a publisher were at this time remarkable. I had issued The God-Eater and The Star & the Garter through Charles Watts & Co. of the Rationalist Press Association, but there was still no such demand for my books as to indicate that I had touched the great heart of the British public. I decided that it would save trouble to publish them myself. I decided to call myself the Society for the Propagation of Religious Truth, and issued The Argonauts, The Sword of Song, the Book of the Goetia of Solomon the King, Why Jesus Wept, Oracles, Orpheus, Gargoyles and The Collected Works. — The Confessions of Aleister Crowley. New York, NY. Hill and Wang, 1969. Page 406. Mr. Crowley has always been, in my opinion, a good poet; his “Soul of Osiris,” written during an Egyptian mood, was better poetry than his Browningesque rhapsody in a Buddhistic mood; but this also, though very affected, is very interesting. But the main fact about it is, that it is the expression of a man who has really found Buddhism more satisfactory than Christianity. Mr. Crowley begins his poem, I believe, with an earnest intention to explain the beauty of the Buddhistic philosophy: he knows a great deal about it; he believes in it. . . . But Mr. Crowley has got something into his soul stronger even than the beautiful passion of the man who believes in Buddhism; he has the passion of the man who does not believe in Christianity. He adds one more testimony to the endless series of testimonials to the fascination and vitality of the faith. For some mysterious reason no man can contrive to be agnostic about Christianity. He always tries to prove something about it—that is unphilosophical or immoral or disastrous—which is not true. . . . A casual carpenter wandered about a string of villages; and suddenly a horde of rich men and sceptics and Sadducees and respectable persons rushed at him and nailed him up like vermin; then people saw that he was a god. He had provided that he was not a common man, for he was murdered. And ever since his creed has proved that it is not a common hypothesis; for it is hated. Next week I hope to make a fuller study of Mr. Crowley’s interpretation of Buddhism . . . suffice for the moment to say that if this be indeed a true interpretation of the creed, as it is certainly a capable one, I need go no further than its pages for example of how a change of abstract belief may break a civilization to pieces. Under the influence of this book earnest modern philosophers may, I think, begin to perceive the outlines of two vast and mystical philosophies, which if they were subtly and slowly worked out in two continents through many centuries, might possibly, under special circumstances, make the East and West almost as different as they really are. —The Daily News, G. K. Chesterton, date unknown. Mr. Crowley’s poetry, if such it may be called, is not serious, at any rate, in its form. It is more colloquia, than the Ingoldsby Legends, and his matter, or rather his way of expressing it, is distinctly, though quite needlessly, calculated to irritate, not only the Christians to whom it is directly addressed, but even every serious-minded man of any religion whatsoever. . . . And yet Mr. Crowley’s book shows wide reading. If the form and tone of his work prevent his being read, Mr. Crowley will only have himself to thank. —The Yorkshire Post, date unknown. The Sword of Song, called by Christians the Book of the Beast. By Aleister Crowley. 10s. Society for the Propagation of Religious Truth, Benares. The most remarkable thing about this volume is the luxury of its material appointment—thick, glazed paper, head-lines and side notes on every page printed in red, while the main body of the book, verse and prose, is in handsome black. This is always something, but it handicaps the poet, and a reader naturally expects something tremendously fine in the way of afflatus to fill all this typographic sail. Well, the poetry here is disappointing. It is not so much that it is absolutely unintelligible; for a poet may talk consummate nonsense, if only he do charm; but the truth is, it is metaphysical, mystical, not to say esoteric; and (to make no bones about it) dull. The one idea of both the verse and the prose essays in the appendix seems to be to discredit Christianity and exalt Buddhism. But when the author annotates one of his lines thus—“This and the next sentence have nineteen distinct meanings,” and the reader is not able to make out any of the same, it is almost twenty to one he won’t enjoy the book. Sometimes the rhyme and the rhythm suggest an imitation of Browning; but, so far as the thought is concerned, Browning, in comparison with this author, is positively pellucid. —The Scotsman, 17 October 1904. Ye Sword of Song, by Aleister Crowley (Society for the Propagation of Religious Truth, Benares), is appropriately dedicated to fools. The plan of the poem is described as "Conspuez Dieu." It is a jumble of cheap profanity, with clever handling of metre and rhyme. Christianity will survive—but the author's reputation may not be so fortunate..
— The St. Jame’s Gazette, 20 January 1905. “The Sword of Song” is a masterpiece of learning and satire. In light and quaint or graceful verse all philosophical systems are discussed and dismissed. The second part of the book, written in prose, deals with possible means of research, so that we may progress from the unsatisfactory state of the sceptic to a real knowledge, founded on scientific method and basis, of the spiritual facts of the Universe. It is not easy to review Mr. Crowley. One of the most brilliant of contemporary writers. . . . Mr. Crowley’s short poems in particular reveal the possession of a beautiful and genuine vein of poetry, which, like the precious metals, is at times scarcely discernible among the rugged quartz in which it is embedded. With a true poetic feeling allied to remarkable learning, and with a pretty with of his own, Mr. Crowley is well equipped for producing a work of permanent value. . . . Good work may be found in “The Sword of Song,” but there is even more which will arouse in the average reader (to whom, however, Mr. Crowley obviously does not appeal) no other feeling than one of sheer bewilderment. Sometimes an oasis of beauty will reveal the author’s power to charm, the good-humoured egotism will tickle the fancy, the quaint allusiveness of the notes will raise the eyelid of wonder. . . . With regard to the prose portions of the volume, the essay on “Science and Buddhism” reveals some penetrating touches; but we have to confess that the discourse on “Ontology” baffles our comprehension. The poetical epilogue is beautiful and contenting. “The Star and the Garter,” by Aleister Crowley. - The poems of Aleister Crowley are “caviare to the general,” popular editions notwithstanding. “The Star and the Garter” is a peculiar dissertation on love, which, so far as we understand it, appears to be a justification of fleeting passions leading up to the “star” of a pure attachment, which, however, is in no wise injured by the lesser loves, symbolized by a “garter.” “Ye Sword of Song” (called by Christians “The Book of the Beast”) is full of erudition and satire. In it all religions are discussed and discredited, and a great agnostic conclusion is stated and proved. The second part of the book is written in prose, and “deals with possible means of research so that we may progress from the unsatisfactory state of a sceptic to a real knowledge founded on scientific method and basis of the spiritual facts of the Universe.” “The Star and the Garter” has been called “the greatest love poem of modem times,” and a scheme is on foot to furnish every free library, every workman’s club, every hotel, every reading-room in every English speaking country in the world with a copy of “Ye Sword of Song.” All particulars can be obtained from the Secretary S.P.R. T., Boleskine, Foyers, Inverness. —The Bath Chronicle, 24 November 1904.